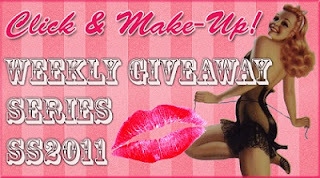 Click and Make-Up Beauty Blog: Win a Sigma Kabuki Brush! It's getting to the end of my S/S 2011 Giveaway Series, but I still have a few things up my sleeve for you, this week it's a fantastic kabuki buffer brush -the F45 - from Sigma. I was sent this one to review, and the winner will receive a shiny new one direct from the lovely people at Sigma. I'm massively impressed with the quality of this natural bristle kabuki - I have offerings from MAC, Inglot, Elizabeth Arden and Bare Minerals, and this is the Sigma one is definitely the softest, and best value. It's ideal for buffing in mineral foundation, but I've been using it to set my tinted moisturiser with MAC MSF Natural in Light. This giveaway will run until Saturday 20th August and the winner will be announced on Sunday 21st August. Hi!! I follow you as Sonsoles Castro. That brush looks soooo soft :-) Awesome price! I follow you as Ria via GFC and my email is on my profile page! Would love a proper kabuki brush! I love Sigma brushes so much! I'm in need of another Kabuki, looks nice! Thanks for this giveaway, looks like a lovely brush! I follow via GFC & I'd love to win! I am a twitter follower and tweeted as KrispyTinCan. Enter me please! I'm already a follower via GFC. My nick is fisiwoman. Yay, another great giveaway Kat :) I've never tried Sigma brushes but would love to! Hello, I want to enter!! Hi Kat! I just read your post on the Stella McCartney fragrances which led me here. How did I not know you were doing a give-away? Luckily there are still 2 and a bit hours to go! I follow on GFC as Bel'Rse and my email address is belrse(at)live(dot)co.uk. hey count me in plz !